Set of 12! 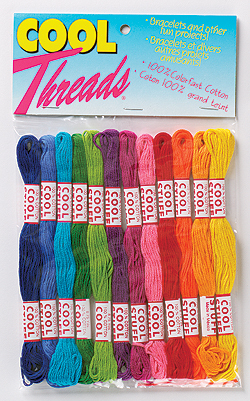 You'll love working with 100% Colorfast Cotton COOL Threads for making bracelets and other fun projects! Package of 12 Skeins of Bright Colors which includes yellow, oranges, pink, red, mauve, purple, greens, turquoise and blues. Each skein: 8.75 yards (8 m) and made up of 6 strands. Product of DFN™, Designs for the Needle, Inc.